Strong rumors circulated on Friday, May 22 that Democrats were preparing another unbalanced budget for FY16, the fiscal year starting July 1, 2015. This budget may get filed in the week starting Memorial Day, May 25. This phony budget is expected to commit $4 billion that Illinois does not possess to the Democrats’ spending priorities. Governor Bruce Rauner has proposed a different budget for Illinois and has strengthened his calls for the State’s government to live within its means. Many House Republicans push for term limits. Having only spent four months on the job, the large class of House Republican freshmen came together in the Capitol Wednesday to express their disgust with the partisan political atmosphere that has engulfed Springfield. The message they came to deliver is there is no better time than now to call for term limits in Springfield. “Illinois requires bipartisan efforts to bring about change, and as we’ve seen in the past, the state hasn’t received it. 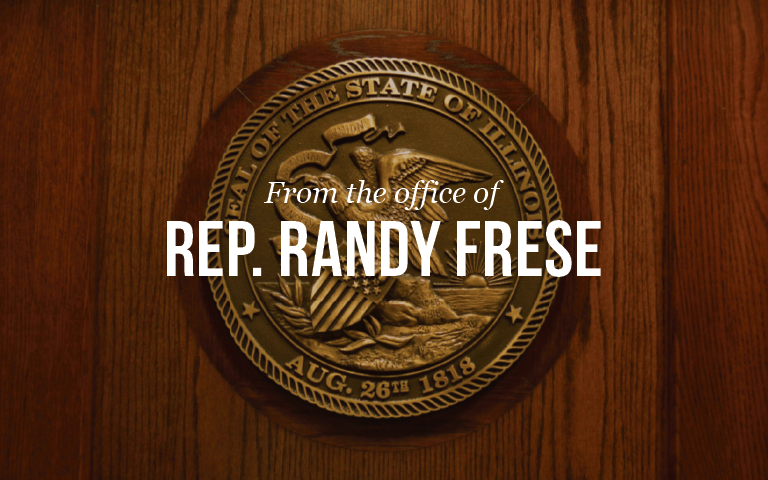 Term limits for members of the General Assembly would help ensure newer, better initiatives are brought to Springfield and voters would receive a much bigger voice away from the status quo,” said Representative Frese. “We all need to work together on solutions that put Illinois back onto a path toward prosperity, and that path must include reforms to how we do business here. One of those key reforms must be the implementation of term limits for members of the General Assembly,” added Representative Mark Batinick (R-Plainfield). HJRCA 26 would have imposed a separate, supplemental 3% surtax upon Illinois incomes exceeding $1 million/year. The trigger number for this surtax would not have been indexed to inflation. The issue was also voted on in November 2014 by Illinois voters in the HB 3816 advisory referendum. Governor Rauner and House Republicans have committed to cutting waste and reforming state government before we begin any discussion of new revenue. Illinois now has a balance of power between those whose first instinct is to raise taxes and those who believe the path to good-paying jobs is through growing small business, not attacking it. Illinois fails to take action to catch up to neighboring states. Sham workers’ compensation language was presented by the Democrat majority to the Illinois House on Friday, May 22. The language was broken up into four separate amendments to HB 1287 to give House Democrats the chance to cast multiple votes against the proposals. Workers’ compensation reform is strongly opposed by organized labor, trial lawyers and other powerful special interests. Governor Rauner and the House Republicans continue to support real workers’ compensation reform as part of an overall agenda to turn around Illinois. To that end, House Republican Leader Jim Durkin filed HB 4223 on Friday, which contains Governor Rauner’s workers’ compensation reform proposals: a higher causation standard; AMA guidelines; fee schedule reduction; and Illinois Workers’ Compensation Commission reforms. Memorial Day to be observed throughout Illinois. The day of remembrance for those who have served our country, especially those who have fallen in its service, will be observed on Monday, May 25. Memorial Day was raised from informal, local day of observance to national holiday through the effort of native Illinoisan General John A. Logan, a veteran of the Civil War and head of the Grand Army of the Republic.